Here we provide our thoughts on some key topics of interest to company owners. 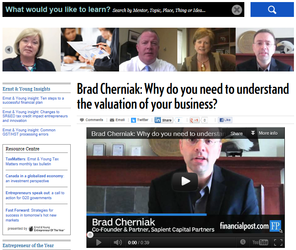 We will add more periodically and would appreciate recommendations of topics you would like to see covered. Please feel free to email us with your ideas. Securing access to funding is notoriously frustrating in Canada, prompting many entrepreneurs to look south of the border for investors. With recent economic turmoil, this is even more of a challenge. The number of businesses that received VC funding in 2008 was roughly half of what it was five years ago. Meanwhile, U.S. firms, which in recent years grew to represent 41 per cent of all VC dollars invested in Canadian companies, are in rapid retreat, dropping from $836 million invested in 2007 to $370 million last year. How is it possible to attract – and retain – investors in today’s climate? Trading Day : July 12, 2010, 2:15PM : Angel and Other Capital for Early-Stage Companies It continues to be a challenge for Canadian start-up companies to access credit. 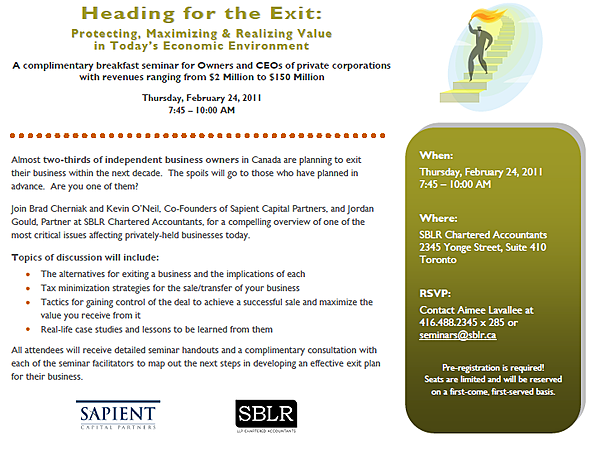 BNN speaks to Brad Cherniak, partner at Sapient Capital Partners, about the plight of small businesses.